Listen to our baffling problem. 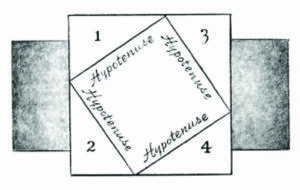 Here is the Egyptian right triangle, the one used by the rope-stretchers, where the sides of the right angle are 3 units and 4 units, and the hypotenuse is 5 units.” Pythagoras drew it on a sandy space and then added a square on each side, and inner squares. He beckoned to the newcomers, who crowded close, multiplying and counting at the same time until all their heads nodded in agreement. “Now let me show you a Greek design involving right triangles.” He drew their attention to the tiled floor on which they were standing, and then traced a similar pattern on the sand, outlining the important parts. 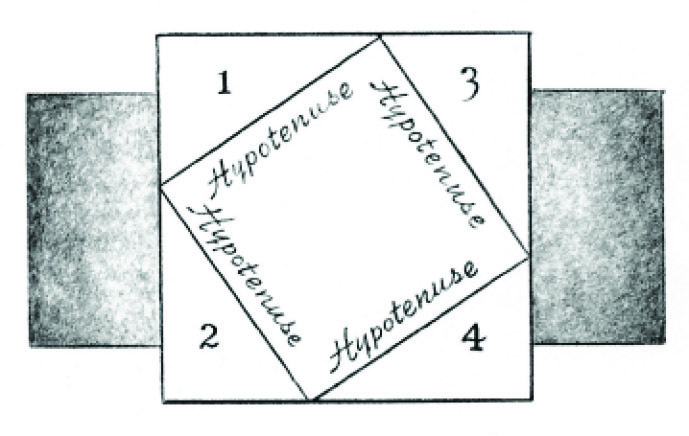 “Here the two sides of the right angle are equal, and the same relation holds.” With his pointer, he indicated one triangle and the related squares, and they all counted together. At this dramatic moment, he withdrew behind a curtain, while attendants played on stringed instruments to indicate an intermission. Pandemonium broke out among the assembled initiates. All the newcomers began talking at once, making suggestions, arguing and shouting. The older mathematicians, who had worked on the problem themselves, were less noisy but even more excited. Finally Pythagoras reappeared. Silence instantly fell over the group as he resumed his lecture. He signalled to attendants to smooth the sand, and began to draw, using his pointer to emphasise his words. “Watch this beautiful construction! I make a square frame, any size, and in its corner I place a small square, any size. Next I draw straight lines, continuing the sides of the small square to the edge of the frame. “Do you see what my frame now contains? 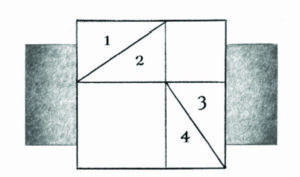 A small square and a medium square, and two equal rectangles. “And next – we are almost there – I simply add diagonal lines across the rectangles! Pythagoras beckoned to the attendants, who poured coloured sand from jars onto the parts of the drawing, so the pattern showed plainly. Pythagoras paused while a low murmur of awe rose from the initiates. “Now watch!” he intoned. And while they all craned their necks to see and the attendants poured more coloured sand, Pythagoras drew his final masterful figure. “Watch well! I have only to swing and push these four triangles around, like this, so that they fit perfectly into the four corners of the frame, and my frame is now completely filled by the same four equal right triangles plus the square on the hypotenuse! A mighty shout – we can imagine – went up from the assembled group. 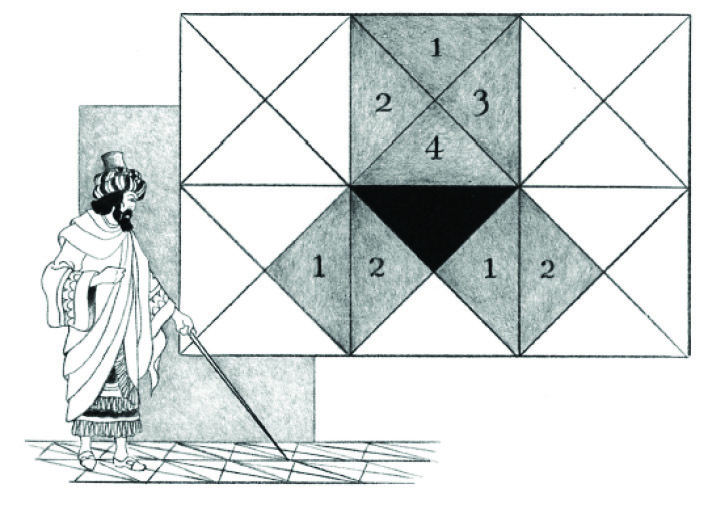 For this theorem was a true landmark in the development of geometry by the Pythagoreans. 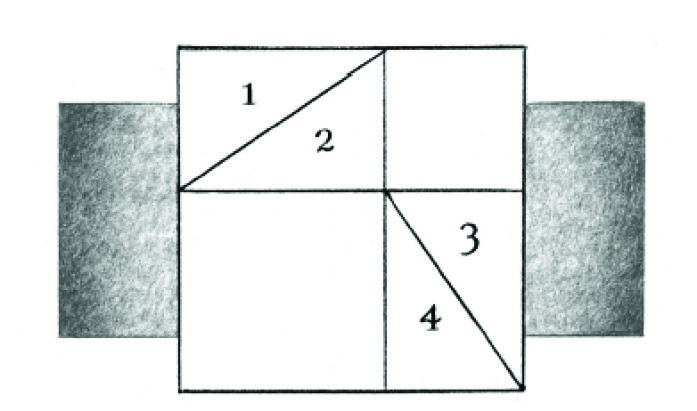 Almost all later geometric work involving lengths and measurement was based upon it. And this style of solving problems, especially equations, by diagramming them, would remain a chief trait of Greek geometry. String, Straight-edge and Shadow weaves history and legend to explain the story of geometry and the discoveries of the most famous mathematicians. A useful and inspiring book for those teaching geometry. Check out our Steiner-Waldorf Teachers’ Hub for information on relevant books, downloadable resources and FAQs.